The D.H.86 was conceptually a four-engined enlargement of the successful de Havilland Dragon, but of more streamlined appearance with tapered wings and extensive use of metal fairings around struts and undercarriage. The most powerful engine made by de Havilland, the new 200hp (149kW) Gipsy Six, was selected. For long-range work the aircraft was to carry a single pilot in the streamlined nose, with a wireless operator behind. Maximum seating for ten passengers was provided in the long-range type, however the short-range Holyman aircraft were fitted with twelve seats. Investigations in 1936 following a series of fatal crashes resulted in late production aircraft being built with additional fin area in the shape of vertical "Zulu Shield" extensions to the tail planes to improve lateral stability - these aircraft were designated D.H.86Bs. 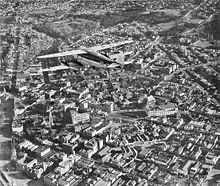 Picture - A Union Airways of New Zealand de Havilland D.H.86 flies over Dunedin. Seriously lacking in directional stability, the D.H.86s were frequently in trouble. On 19 October 1934 Holyman's VH-URN Miss Hobart was lost in Bass Strait with no survivors. Flotsam that may have been wreckage from the aircraft was seen from the air three days later but surface ships failed to locate it in rough seas; the aircraft had effectively vanished. At the time Miss Hobart disappeared the design of the aircraft was not suspect, and it was thought that an accident may had occurred when Captain Jenkins and the wireless operator/assistant pilot Victor Holyman (one of the proprietors of Holyman Airways) were swapping seats in mid flight. However following the loss of Qantas' VH-USG near Longreach four weeks later while on its delivery flight, it was found that the fin bias mechanisms of the crashed aircraft and at least one other were faulty, although it is doubtful that this had any direct bearing on the accidents other than perhaps adding to the aircraft’s lack of inherent stability. Further investigation revealed that VH-USG had been loaded with a spare engine in the rear of the cabin, and that one of the crew members was in the lavatory in the extreme aft of the cabin when control was lost. It was theorised that the aft centre of gravity condition that thus existed resulted in a loss-of-control at an altitude insufficient for recovery (the aircraft was at an estimated height of 1,000ft (300 m) prior to the crash). On 2 October 1935 Holyman's VH-URT Loina was also lost in Bass Strait, again with no survivors. This time a significant amount of wreckage was recovered from the sea and from beaches on Flinders Island. Investigation of the wreckage revealed a section of charred carpet on a piece of cabin flooring from just ahead of the lavatory door. It was thought possible that a small fire from a dropped cigarette had led to someone running aft suddenly to stamp it out - the sort of sudden change in weight distribution that could set up a fatal loss of directional control while the aircraft was on a low-speed landing approach. On 13 December 1935, another Holyman DH86, "Lepina", forced-landed on Hunter Island off northern Tasmania with the lower port interplane strut having 'vibrated loose'. An investigation by the Australian Civil Aviation Board using stop-motion film of the wing in flight resulted in identification of wing distortion and failuer under certain flight conditions. Australian authorities in December 1935 required the installation on all Australian DH86 aircraft of a complete set of lift bracing in the wing rear spar and redesign of the bracing on the tail unit to provide greater redundancy. The Royal Air Force's Aeroplane and Armament Experimental Establishment tested the D.H.86A design in 1936 following three fatal crashes in Europe. It would be forty years before the report was published - one of the most damning indictments ever written on the design of a commercial airliner put into series production. The D.H.86 had been rushed from design concept to test flight in a record four months to meet the deadlines set by the Australian airmail contracts, and a lot of attention to detail had been ignored. It was a big aircraft for its power, and as a result very lightly built. There was poor response to control movements in certain speed ranges, the wings were inclined to twist badly if the ailerons were used coarsely and, most seriously, the vertical tail surface was of inadequate area. The result was an aircraft that, although quite safe under normal conditions, could rapidly get out of control under certain flight regimes. Although the control problems were overcome on later-manufactured D.H.86Bs by the fitting of a new spring in the elevator control and the fitting of auxiliary fins, the results of these tests do not appear to have been communicated to Australia and the D.H.86s already in use were never modified in this way to improve their safety. This lack of communication may have caused a number of later accidents including at least one of two further fatal disasters in commercial service. The mid-air break-up of Qantas' VH-USE Sydney in a thunderstorm near Brisbane in 1942 with the loss of nine lives was possibly unavoidable, however the fin was found almost a mile away from the main wreckage, which was burnt without an investigation being carried out. The accident involving MacRobertson Miller Airlines’ ex-Qantas aircraft VH-USF at Geraldton on 24 June 1945 most likely was entirely avoidable had the AaAEE report been communicated to Australia. On its first commercial flight for its new owners after military service, the pilot and a passenger were killed in a classic loss-of-control accident while taking off with a heavy load in gusty conditions. Another D.H.86, VH-USW (the former Holyman's Airways Lepena), was bought by MacRobertson Miller Airlines at much the same time as VH-USF and was the last of the type to fly in Australia. MMA sold the eleven-year-old aircraft to an English company late in 1946; it was abandoned in India in an "unsafe state" while on her delivery flight. Edgar Johnston, the Assistant Director General of the Australian Department of Civil Aviation, then had it scrapped at Australian Government expense to make sure that it never flew again. Following the first three fatal Australian D.H.86 accidents and a forced landing to VH-USW Lepena on 13 December 1935 (a Friday) when the pilot believed his aircraft was about to break up in mid-air, the Australian Government temporarily suspended the type's Certificate of Airworthiness. This caused outrage in Britain as it reflected on the whole British aircraft industry. In fact, the D.H.86 had approached the limits to which traditional "plywood and canvas" aircraft construction could be taken, and was obsolete compared to all-aluminium stressed-skin aircraft like the Boeing 247 and the Douglas DC-1 that were already flying before it was even designed (and the immortal Douglas DC-3 had its first flight just four days after the forced-landing of VH-USW). Under pressure from Holymans and other companies, the Australian Government rescinded its ban on the import of American aircraft during 1936, and for the next 25 years most large commercial aircraft imported into Australia were of American manufacture. D.H.86: Four engined medium transport biplane. First production version with single-pilot cockpit. D.H.86A: Improved version with wider cockpit for two pilots. D.H.86B: Fitted with auxiliary endplate fins to the tailplane. Jackson, A. J. (1988). British Civil Aircraft 1919-1972: Volume II (1988 ed.). London: Putnam (Conway Maritime Press).